Does anyone know if theses are any good? And the proper alignned camber adjustments for these? 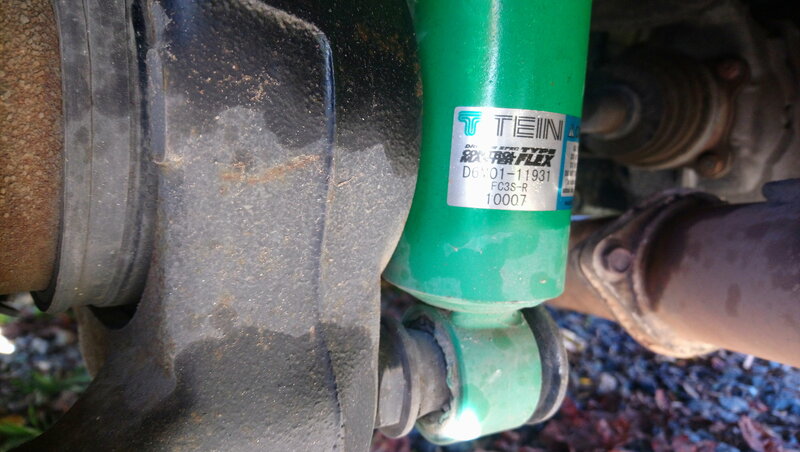 Yes, Tein is a well known quality aftermarket shock for Japanese vehicles. "Proper alignned [sic] camber adjustments"? Not sure what you're asking. What year FC do you have? Not typically adjustment on shock mounting. Hard to tell from the picture, but there might be some issue with the lower bushing on that shock. what are those bushings called? i need to get replacements asap. Rear/Foward Control Arm bushing? Megan coilovers, d2 racing coilovers and ksport coilovers which is better. Spending as much on suspension as a set of coilovers, should I just get coilovers? Difference between Tein HE (drift) coilovers and Tein HA (track?) coilovers? 1990 Vert FC Cranks but won't start ?